Second Life builders and designers coming over to OpenSim might think that it’s the same thing, except for the lack of support for some high-end vehicle physics scripting commands — and bigger prims. In fact, OpenSim actually offers some unique benefits that designers should be ready to take advantage of. This may seem obvious. 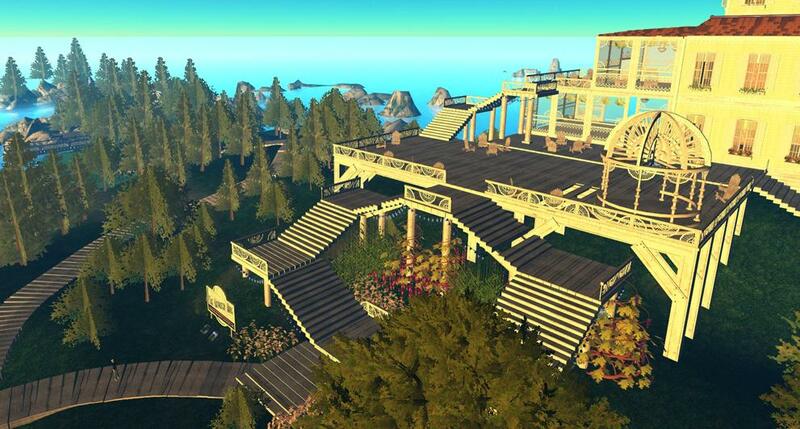 You build what you would build in Second Life, but pay less for the land. But there are big implications to this. If you’re running a company or school grid, you can pretty much put up as many regions as you’d like, at little or no additional cost. That means that you can spread out your builds. Throw out all your annoying skyboxes. Dedicate whole regions to particular functions. That requires a different attitude towards building. For example, people are going to teleport in based on region names, which means that they’ll land right in the center of a region. So make sure that your visitors don’t land underwater — or, even worse, under a building! An underwater landing on a region in OSGrid. Oops! How do I get out of here? Since you’re not cramped for space, make sure that your venues are clearly visible from the landing point. So, for example, if one of your region is a “Freebies” region where students and staff can pick up appropriate clothing — or plants and furniture with which to decorate their offices — make sure that the storefronts are clearly visible from the center of the region. Similarly, if your region is called “Conference Hall” or “Breakout Rooms” make sure that nothing blocks your visitors’ view of the Conference Hall or Breakout Rooms entrances. You’d find that you have to give out fewer landmarks, your visitors will have an easier time navigating the space, and you’ll have an easier time building it. There are OpenSim builds out there with hundreds of thousands of prims on a single region. The only limit is how much server space you’ve got — and server space is getting cheaper by the minute. Okay, to a great degree this depends on the users’ connection speeds. If your users are students or employees logging in via high-speed Ethernet networks, you can afford to put more prims and textures on your land. But you may still want to minimize loading speeds for users logging in remotely by reducing the number of textures in your builds. For schools and companies, where your community is already used to stark, bare, minimalist architecture, this might actually not be much of a handicap. Instead, use your prims where they’ll have the most impact — 3D visualizations of folding protein molecules, that kind of thing. Either way, there’s no prim police looking over your shoulder. In Second Life, you can only export objects where you personally have created every component from scratch. That’s not the case in OpenSim, where you can save backups of entire regions. This means that you can use third-party components — as long as you have the appropiate licenses for them, of course. Two great places for Creative Commons-licensed content are LindaKellie.com and OpenSim Creations. Open source region OAR files are available from OpenVCE. Backups also mean that you can store away regions when you’re not using them. For example, if your company does a big annual conference, you can save OARs of all your conference regions, and fire them back up again next year — all the objects, all the scripts, terrains, textures, everything in its place. No more fussing around with linksets and worrying about them disappearing from your inventory. You can make your backups more useful by taking note of Tip #1, and not packing too much stuff into a single region. Instead of packing ten different classrooms inside one region via rezzers and holodecks and skyboxes, just have a separate region for each classroom. Then it will be easier to find it later, and easier to update it. And if you’re running a grid for a business, non-profit, or school and your hosting provider doesn’t let you easily back up full regions — switch hosting providers. This should be a no-brainer, and most vendors are now offering it as a standard service. Don’t want an ongoing construction project cluttering up your beautiful grid? Have the builders take it offline. With OpenSim, builders can work on a build individually, on their own computers, then upload the entire region to the grid when its ready. 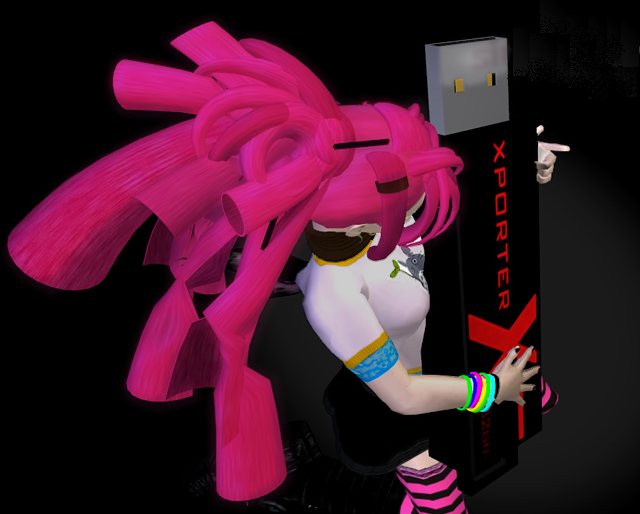 Check out Ener Hax’s Sim-on-a-stick for an easy way to run OpenSim locally — even on a USB stick! 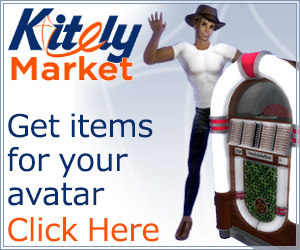 If you need to work collaboratively with another builder, consider using Kitely. It’s 20 cents per user per hour, and you can upload and download OAR files with the click of a button. Best of all, you can limit access to just yourself and your colleagues — then download the region and delete it from Kitely when you’re done. Or keep it there as a backup — Kitely charges just 10 cents a month to store regions that aren’t visited. Right now, Kitely is the easiest way to get a region up quickly — it’s a self-serve website and you’ll be up and running in a couple of minutes. But other OpenSim hosting providers are working on offering similar technology, so watchout for developments in this area. Working inside Second Life, licensing agreements are often an afterthought. After all, does it matter that your content provider gives you the rights to backup your content, if the technology doesn’t allow you to because you didn’t create the content yourself? As a result, folks working inside Second Life have gotten used to using the built-in permissions system as a substitute for license contracts. And, in fact, under the Second Life terms of service agreement, content creators might not even be able to sell rights to their Second Life content, since Linden Lab actually owns everything, and can, at will, turn off access to any content it wants. Creators only own the rights to things that they create outside of Second Life — the original textures, for example, that the use in their builds. Not the builds themselves. That’s certainly not the case in OpenSim. 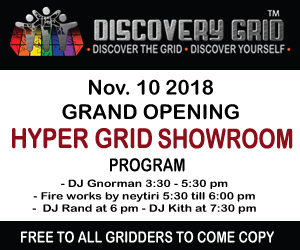 Running an OpenSim grid is more like running a website. If someone is providing photographs or text for your website, you can have license agreements in place to ensure that your company or organization gets the rights it needs. You can extend those contracts to the OpenSim environment as well. When you hire outside builders and designers — or buy or download content from the web — check the license terms. Ask for work-for-hire or full rights contracts from freelancers, and look for “Creative Commons” and “site license” agreements from content vendors. If you own your grid, your company owns the copyright to the grid as a whole — just as it owns the copyright to its website. Even if individual creations on the grid might come with third-party licenses, the company owns the copyright to the particular arrangement of those creations. However, you might want to create a database of digital assets, if you don’t have one already, to organize your company’s virtual property — textures, animations, OAR and IAR files, and mesh and XML objects. Not only will this database allow you to find content quickly if you need it again, but it will also protect you in case of a lawsuit.